I have pushed these three copper coins to Grade C in Marks of Rareness of the Collected Currencies. I think it may be not so suitable, as they are not so rare. They are the only three copes of the 5-cash copper coins I have, after many years of searching in Hong Kong. Normally, they are worth about ten times of the 10 cash copper coin minted in the same province in the collecting circle of Hong Kong. I would like to know their valuations in the other places of the world. 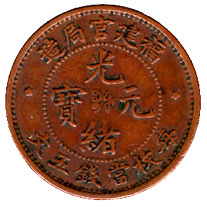 This milled copper coin was first minted in Foochow of Fukien Province in 1900. During the period, there were two official mints existed in Foochow. They are Fukien Silver Coin Bureau (or known as Southern Bureau established in 1898) and West Branch of Fukien Machinery Bureau established in 1890 [later known as Copper Branch of Fukien Machinery Bureau]. These 2 mints combined with Mamoi Foochow Shipping Administration Bureau as Fukien Mint Branch under former Ministry of Revenue in 1905. I think this coin was minted in West Branch of Fukien Machinery Bureau, as the Mint renamed as Copper Branch of Fukien Machinery Bureau later. On the center of the obverse are 4 Chinese characters reads "Kuang Hsu Yuan Pao" and means "Kuang Hsu Valuable Coin" and 2 Manchu scripts (Fu Kien Mint) inside beaded circle in centre: in the outer circle, Chinese characters (made in Fukien Official Bureau) above, (Every One Equivalent to 5 cash) below; small rosettes right and left. On the reverse is the symbol of the Qing royal family, the dragon (This is a Side View Dragon normally used in copper coins.). 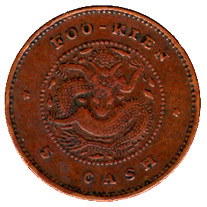 Around the dragon are the words in English "FOO-KIEN" at the head of the dragon and "5 CASH" at the foot of the dragon. 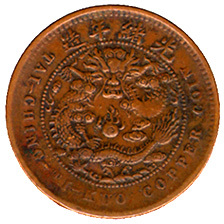 This 5 cash Hupei Dragon copper Circular coin was inssued in 1906 with the sexagenary year written in Chinese "Ping Wu" on the obverse. A Chinese character "Ngo" meaning Hupei Province inscribed in center, surrounded by Chinese (Great Ch'ing copper Coin) within beaded circle. 2 Chinese characters "HU POO" (Board of Revenue) on each side of the center in the outer circle, the Emperor's reign title in four Manchu characters with two Chinese characters denoting the sexagenary year of the issue above, and Chinese (Equivalent to 5 Cash) below. On the reverse are Flaming Dragon emblem in center, surrounded by stylized clouds within beaded circle; above in outer circle, Chinese means made in the Reign of Kuang Hsu, below English "TAI-CHING-TI-KUO COPPER COIN". TI_KUO means empirs. The design of this 5 cash Chekiang Dragon copper Circular coin is the same as the above one. It was inssued in 1906 with the sexagenary year written in Chinese "Ping Wu" on the obverse. A Chinese character "Che" meaning Chekiang Province inscribed in center.